Spring is just around the corner and our wardrobes are ready for a serious overhaul - goodbye big comfy jumpers hello shorts! Each year, it is without a doubt that girly, floral, pastel fashions will be taking over the high street. 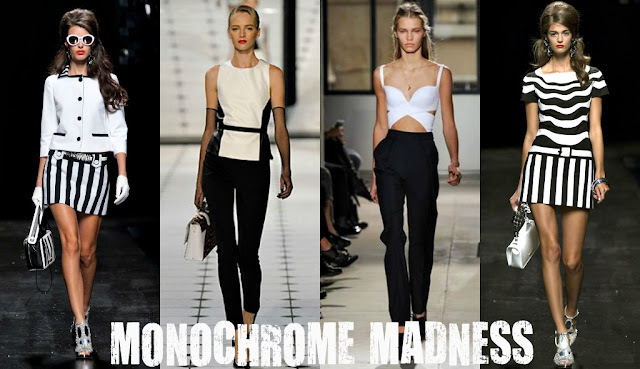 However, this year to the shock of many fashionistas, Monochrome was seen all over the catwalks for this years SS collection. I absolutely love this trend as black and white looks flattering on anyone and I think it is going to be a huge success. You can look girly, edgy and elegant all at the same time - just think Audrey Hepburn and you've got the picture! Will you be joining in with this trend? Monochrome is looking good! :) cute blog!